Signs of Life? Or Not. We were blessed with a beautiful spring day here in Minnesota with temperatures reaching into the 50’s. Finally! It was a gorgeous day to get outside and start checking for signs of life around the farm. 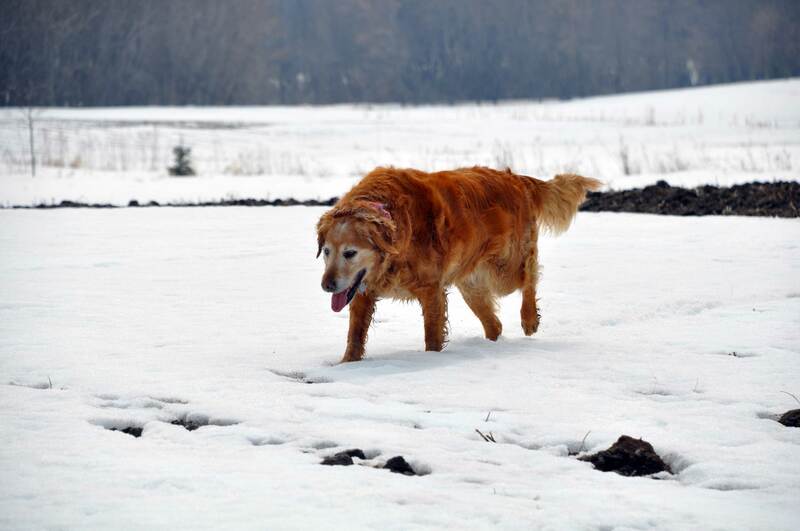 Since the snow finally started melting, Jesse decided to make his way out to the beehives to check on them. 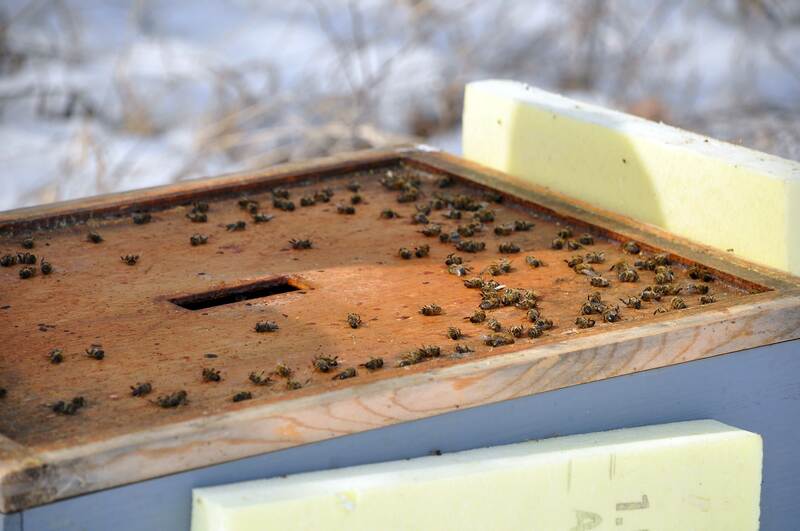 After 50 plus days this winter of high temperatures not even reaching zero degrees Fahrenheit, our expectations were very low about the likelihood that our bees survived. When our bee supplier called in January, we decided to play it safe and order two more nucs of bees to install this spring to make sure we were not left without any bees. As it turns out, we made the right decision! We knew it was a bad sign this afternoon when Jesse pulled the covers off the hives and we saw the carnage of dead bees on the inside hive cover. There was also an eerie silence that was a tell-tale sign that the bees had not survived. It was the same scene when he opened the second hive. No survivors. No signs of life. We will start fresh with new bees this spring. Again. Our snow cover was melting quickly today with the warm temperatures. 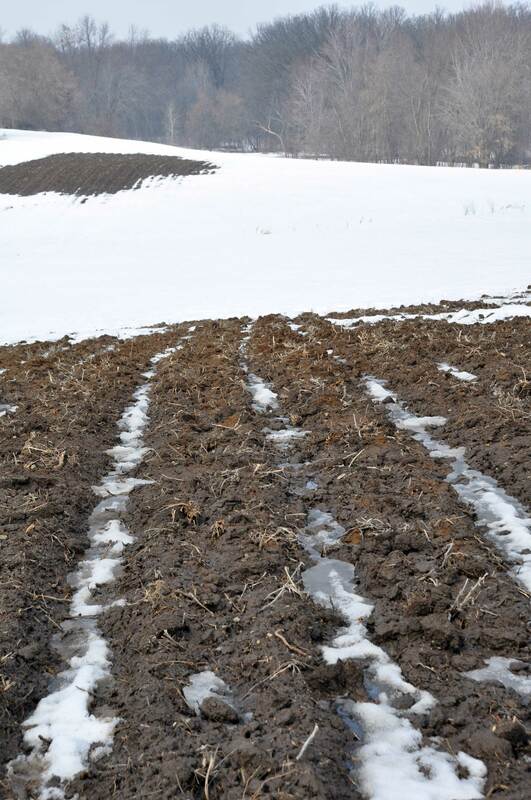 The turned soil is starting to reveal itself in the plowed field next to our house. The neighbor planted a bean crop last summer and plans to re-seed an alfalfa crop this spring. This will delight our new bees. Wherever we wander on the farm, including out to the bees,we can always count on Sofie being somewhere close by. She is a constant sign of life on the farm, even in the bleakest of times. Dogs are such comforting companions. After visiting the bees, I trudged through the heaps of piled snow to get to the edge of my vegetable garden to take a picture. With a solid foot of snow remaining within the perimeter, there is sadly no sign of life here. It is hard to imagine that in a few short months this will be green and brimming with new growth and possibilities. The warm temperatures today did manage to stir awake the juices of the maple trees. We ventured in to the woods and discovered the first signs of the sap running. Although it was not a very productive day (only about 1 gallon), it is a start. And after this long winter, I will celebrate any sign of life that reveals itself around here! The river bottom behind our house is filled with large maple trees. As if we aren’t already busy enough trying to keep up with all of our kids’ activities and our other projects around the farm, we decided to try to make our own maple syrup after – you guessed it – seeing this great article entitled “Sugar From Trees” in the March/April 2009 issue of Minnesota Conservation Volunteer. Our beekeeper friend also produces and sells maple syrup on a larger scale and Jesse went to observe his operation last spring. 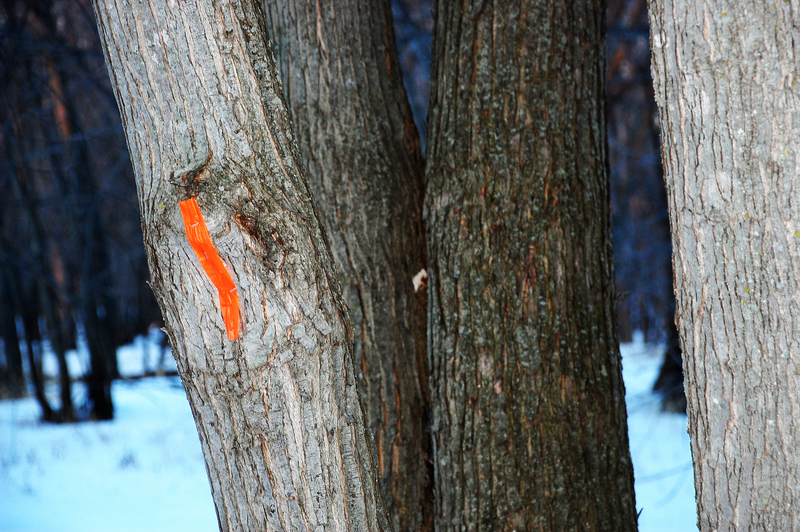 Last fall, while the trees still had leaves, we identified sugar maple trees and marked them with orange tape. As the weather started to warm up during the days this week into the low to mid 40’s (“warm” is a relative term when you live in Minnesota), we knew it was time to get the trees tapped. The best syrup is made from maple sap after it first starts to run in the spring. 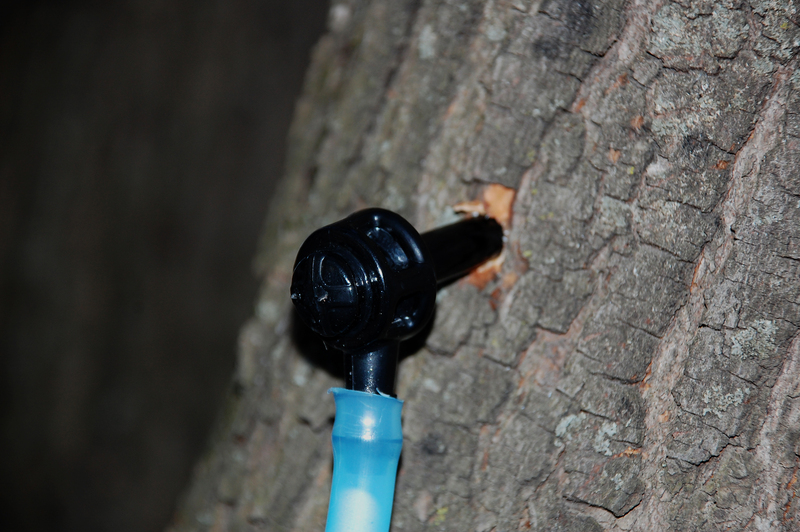 Tree sap starts to flow when temperatures rise above freezing during the day but fall back below freezing at night. To tap the trees, Jesse and our oldest drilled holes into the tree trunks and inserted spiles. Sap drips out of the tree during the warm days and into the spile. We purchased plastic spiles on-line from Leader Evaporator, but there are also metal ones. I’m not sure why we got plastic, other than it was more cost-effective. 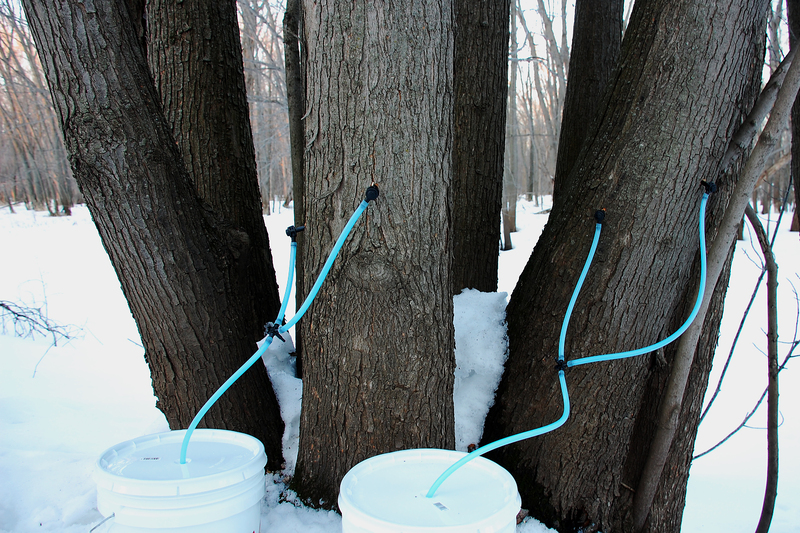 We also purchased some tubing to attach to the spiles to direct the sap into buckets sitting next to the trees. The length of the sap run can vary, sometimes ending after only a few weeks. 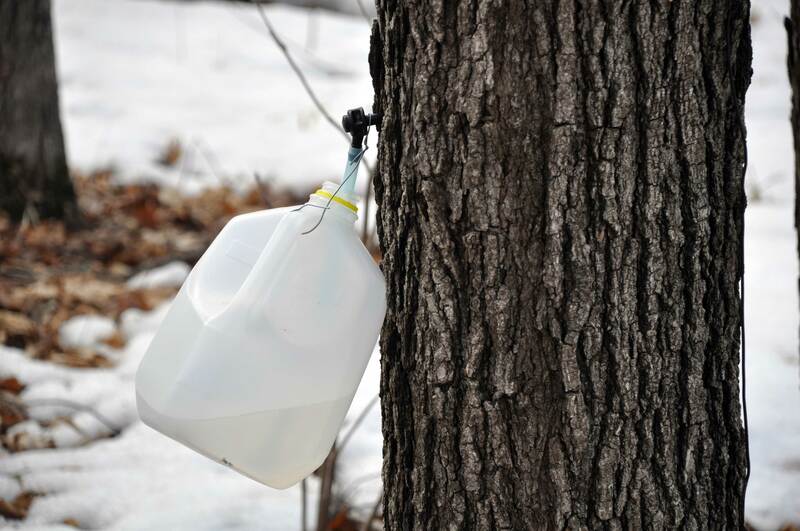 Even though the tree sap flows through fall, once the weather warms up and stays above freezing at night, any syrup made from the sap won’t taste good any more. We tapped a total of five trees, each with two spiles running into a five gallon bucket. The temperature had already dropped below freezing when they were tapped tonight, so it was not evident whether the sap is running yet. We have a large plastic drum to collect the sap in so that we can refill the buckets. 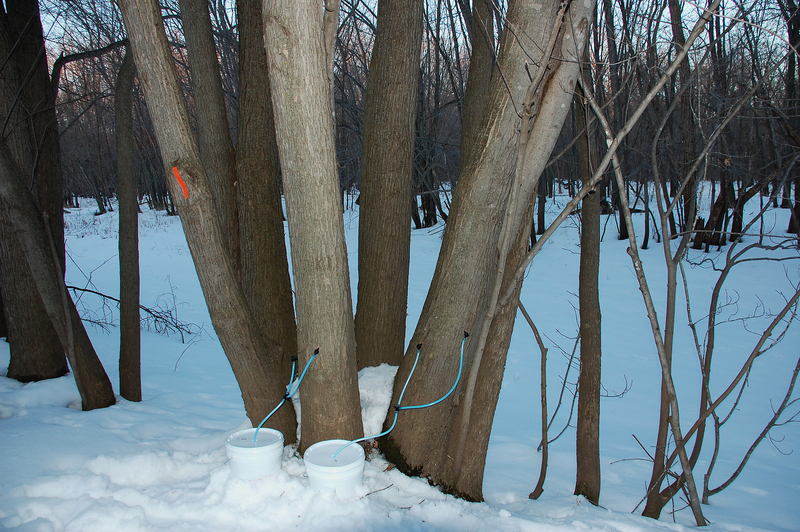 It takes around 40 gallons of sap to make a gallon of syrup! There are a lot of steps that need to successfully be completed between collecting the sap and having maple syrup. We need to collect the sap, keep it cool, cook it down the right amount, and boil it to the proper temperature. I have no idea how this adventure will play out, but it always fun to try something new…even if we don’t really have the time.